Richard is now six months into his recovery from the accident that left him paralyzed. Now a quadriplegic with no use of his legs and limited use of his arms, Richard has spent the past five months at the Seattle VA where his physical strength has stabilized as well as the neck injury and his broken forearm, which has healed enough to begin weight-bearing activities. Our friends and family consistently offer positive encouragement which has been a lifeline to life outside the hospital and a vivid reminder to Richard and me that people care. We are reaching out to you to help us pay for this chance to improve Richards muscle functions at Pushing Boundaries which may lead to more freedom and independence. The Exercise Therapy team work one-on-one with Richard to re-establish neurotransmission through repetitive exercises, gait therapy and electro stimulation. 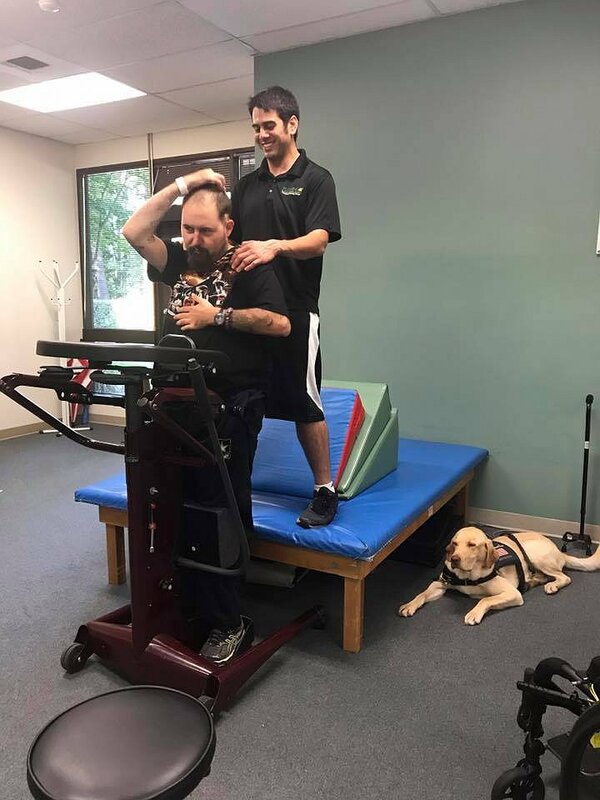 The more time Richard participates in intensive exercise, the more strength and independence he will achieve. Richard would like to commit to at least a three-month program which will cost $8000. To help with the financial burden of uninsured expenses, a fundraising campaign has been established in honor of Richard Carson with Help Hope Live, a trusted nonprofit organization that has been providing community-based fundraising guidance to help patients and families in need for more than 30 years. All donations are tax deductible to the full extent allowed by law and are held by Help Hope Live in the Northwest Spinal Cord Injury Fund in honor of Richard Carson. Donations are allocated by Help Hope Live based on financial need for medical expenses. Please consider making a contribution today. We are extremely grateful for the generosity of our family and friends. Thank you for any help that you can offer. Richard Carson began volunteering with his local Arizona fire department during his junior year of high school. As a volunteer with the department he responded to multiple calls for brushfires, structure fires, motor vehicle accidents, as well as medical situations. By the time he graduated high school, he had completed the fire academy and was certified as an Arizona State firefighter. Soon after graduation, he went on to become certified to fight brushfires and enrolled in an EMT certification class with plans to become a reserve firefighter. The day he signed up for his EMT class was also the day of his first major tragedy. Richard arrived home from signing up for his EMT class to find his dad had committed suicide in the living room. After finding his dad, Richard went to the fire station and rode in the ambulance back to his house to do his job as a firefighter. Once they arrived at his house, the other firefighters insisted he not go inside and tasked him with calling his mom to tell her to come home, then make arrangements for his sister to be picked up from school so she did not ride the bus home to find out what happened on her own. This tragic event occurred August 2007. The months to follow were very difficult for Richard and his family as they not only had to make funeral arrangements but also decide if they were going to move and where they were going to live. Richard’s mom and sister moved to Washington State but Richard chose to stay in Arizona with hopes there would be a full-time job opening with the fire department. During this time, he worked several odd jobs with the electric company, lumberyard, Target, as well as construction, and reserve firefighting. After a year of living on his own it became apparent to him the fire department would not be hiring any time soon. He made the decision to join the Army as a line medic. He was sent to Fort Leonard Wood in Missouri for basic training. From there he went to Fort Sam Houston in Texas for AIT. After completing training, he was stationed with 4th ID in Fort Carson, Colorado. The fourth infantry was in the process of moving from Fort Hood, Texas to Fort Carson, Colorado. He was placed with fourth brigade combat team for two months. In August 2009, he was deployed to Afghanistan to join 112 INF Battalion where they needed more medics. After arriving in Afghanistan, he spent his first month at the aid station before being sent to Charlie Company first platoon as a line medic where he spent the rest of his time in Afghanistan. On April 17, 2010, he and his platoon went out to clear compounds. This particular day they were clearing a compound that would be used for over watch later on that night. Upon entering the compound Richard unknowingly stepped over an IED which was then stepped on by one of his team leaders behind him. When the IED went off Richard was critically wounded and landed on top of a secondary IED which did not go off because the safety pin was not pulled. Richard was the only medic and had serious injuries. There was nothing he could do for his injured friend other than instruct the other infantrymen how best to treat the wounds. From here Richard and the two other soldiers that were injured were medevacked to Kandahar. The team leader that stepped on IED died on the surgery table in Kandahar from loss of blood. Richard was stabilized and medevacked to Bagram Airfield to await transport to Washington DC. From Bagram he was sent straight to Walter Reed instead of going to Landstuhl, Germany due to the volcano that had gone off in Europe. For several weeks after arriving Walter Reed, Richard had no idea where he was. Here he started the process of undergoing multiple surgeries and rehabilitation to recover from injuries received. He sustained injuries to his lower extremities as well as severe injuries to his right hand. Due to receiving shrapnel in the rectal area he was also given a colostomy bag. He spent approximately one month at Walter Reed then he was sent to Madigan Army Medical Center at Fort Lewis Washington. Upon arriving at Madigan, he was sent to the VA hospital in Seattle where he spent approximately the next 3 to 4 months until he could be independent. At this point he went to the warrior transition Battalion of Fort Lewis and lived in the barracks. For the next year and a half he underwent multiple surgeries at Madigan and extensive rehabilitation until he was retired on September 11, 2012 with 90% disability. During his recovery, he had a very hard time dealing with not only the injuries related to his time in Afghanistan but also with what happened to his father. Hardly able to walk and relying on the use of a wheelchair, Richard had given up on the only thing he wanted to do after the military which was to go back to firefighting. He felt that he was the worst medic in the world because there was nothing he could do to save his friend. He started drinking heavily, wanted nothing to do with anyone, and was ready to commit suicide. It was during this time that he found therapeutic horseback riding. He began participating in a program called Rainier Therapeutic Riding for veterans with both physical and mental disabilities. He was very hesitant about the program at first but as time went on he became more trusting of others. After seeing what it did for him he wanted to help other veterans that were in the same place that he was so he became a volunteer himself. After going through the therapeutic riding program, he decided to go to nursing school to get his LPN license. While he was going to school, a friend of his made a documentary called Riding My Way Back which was about therapeutic horseback riding for veterans with PTSD. It first aired at the G.I. film Festival in Washington DC at which his friend Aaron who had made the documentary asked him to go with him for the showing. At this showing they talked to many people about the benefits of what therapeutic horseback riding could do for veterans and PTSD. After completing nursing school, he didn’t know what he was going to do next or where he was going to live so he put in a home placement application with a program called Military Warrior Support Foundation. He was selected by the foundation and given a house in Pullman, Washington. Richard made the move to his new home across the state to an area that he didn’t know anybody, didn’t have a job, and no support. Once again, he started drinking heavily. When in Pullman the previous therapeutic riding program suggested he contact the therapeutic riding program at WSU. The local therapeutic riding program did not have a veteran’s program but he contacted them anyway thinking it would at least gave him something to do by helping to clean the stalls during their winter break. This was what led him to volunteer for the PATH program and meet his girlfriend Erica, one of the programs riding instructors and the person Richard was in contact with for stall cleaning. After several months of getting to know each other they started dating and eventually moved in together. At this point he was doing fairly well in his recovery. He had several more surgeries on his right hand at UCLA Medical Center that allowed him to start using his hand with full function again. After getting full function of his hand again, Erica knew how much he wanted to be a volunteer firefighter again and encouraged him to apply at the local volunteer fire department. In 2015, after sitting on the application for months, he finally decided to turn it in and has been an active volunteer firefighter since. Around the time he started volunteering with local fire department he also got a job as an LPN at a nursing home in Tekoa, Washington. Within two years he worked his way up to assistant director of nursing as well as the CNA supervisor and wound care nurse. At this point, everything was going great. Richard and Erica had four horses and five dogs (and a cat!). When he wasn’t working or volunteering with the fire department Richard and Erica would spend their time going horseback riding and hiking with the dogs. On January 30, 2017, which coincidentally is the same day that his dad injured himself and had surgery that eventually led to his suicide, Richard hit a patch of ice on the way to work and rolled his truck down a thirty-foot embankment. He broke five vertebrae in his neck and became a quadriplegic. He also broke both bones in his right forearm. Being in a rural area, it was about an hour before a passerby noticed the car wreck and the fire department was called. Richard struggled to stay conscious for a second hour so he could let the paramedics know he thought he had broken his neck. He was rushed to Sacred Heart Hospital in Spokane where he underwent emergency surgery. After the surgery, the decision was made that he would go to the VA hospital in Seattle to undergo rehabilitation. Now August 2017, he has spent the last five months in Seattle at the hospital. Erica took a leave of absence from her last semester in her Master’s program to be with him. Two horses, all five dogs, and the cat relocated to the Seattle area with them. On Richard’s first trip out of the hospital they took the dogs to a local dog park. For next trip, they visited a nearby equestrian park with their horses where Richard was able to work with his mare, Abby, in a round pen. Even though he had done this many times, it was a very new challenge from a wheelchair but a challenge he and Abby overcame together. To quote Richard, “if I don’t walk again, it will not be for lack of trying”. It may seem impossible for Richard to return to his life before the accident but determination and strong will are his strengths. Richard’s frequent outings into the community, to the dog park, and to the horse arena are beneficial to his recovery. 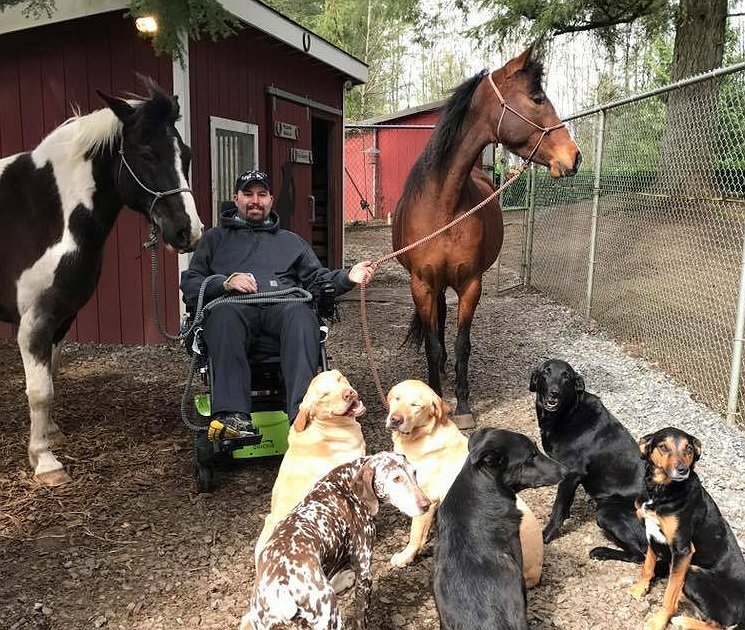 Although Richard is in a wheelchair, being around his horses and dogs brings a sense of normalcy. Now personally experiencing the therapeutic effect of horses for the second time, Richards devotion to share this and help others is even stronger. Monday August 14th marks the first day of Richard’s exercise rehab program at Pushing Boundaries. They worked him hard and he did amazing. Thank you to everyone who has contributed and helped make this first month of the program possible. Richard and I are truly grateful for your continued support. Family and friends of Richard Carson are raising money to pay for uninsured medical expenses associated with Catastrophic Injury. Richard has chosen to fundraise with Help Hope Live in part because Help Hope Live assures fiscal accountability of funds raised and tax deductibility for donors. Donors can be sure that funds donated will be used only to pay or reimburse medically-related expenses. To make a tax-deductible donation to this fundraising campaign, click on the Donate Now button. Richard continues to show improvement. His positive attitude and mission to succeed presses on. I look forward to watching him continue his recovery with the team at Pushing Boundaries.